Valentine’s Day is coming right up! 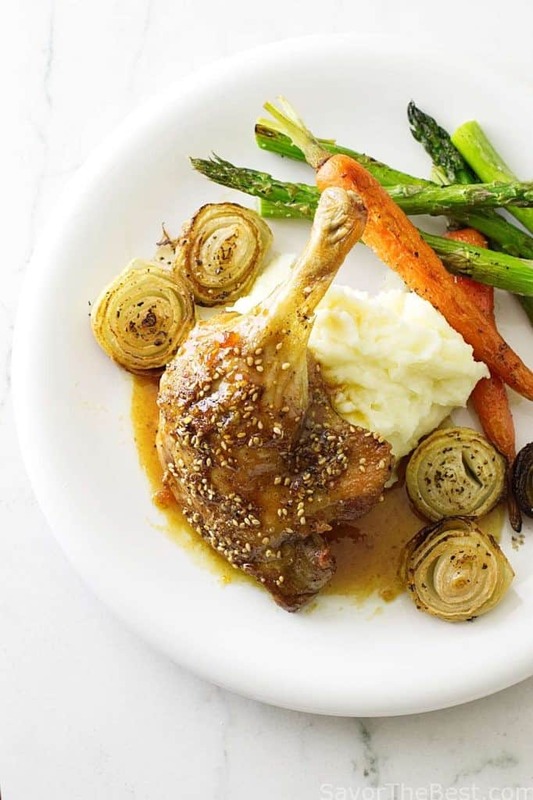 Dukkah Roasted Duck Legs is a make-at-home, elegant entree that will impress your Valentine. Before roasting the duck legs they get a generous dusting of dukkah which adds a touch of magic to the crisp skin of these succulent duck legs. Additionally, a savory-sweet fig glaze adds the perfect balance to the richness of this tender delicacy. You can create your own fancy Valentine’s Day dinner right at home. 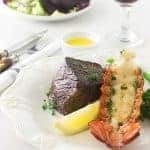 Do you look forward to a Valentine’s Day romantic dinner out on the town? Did you make reservations yet? How much of a dent will that make on your budget? I love planning and preparing our own private, romantic dinner at home. White tablecloth, candles, roses, a bottle of wine and a special, elegant dinner for two. Gone are the days of miss-managed reservations, inflated prices and being rushed by the waitstaff to turn the table for the next guest. I look forward to preparing something special and taking our time with a long leisurely dinner. All things considered, the best meal on Valentine’s Day is a home-cooked meal. And way easier on the budget! 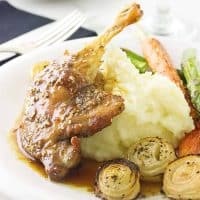 I paid $11 for a Vac/Pac of two duck legs and most of the other ingredients to complete the meal was not a budget-buster. Dukkah: A nut-herb-spice blend with an exotic flavor. Dukkah is pronounced “Doo-ka” and it is an Egyptian condiment made with toasted nuts, seeds, spices, and herbs. It can be purchased in Middle Eastern specialty markets, Trader Joe’s and online. By the same token, you can make it yourself. I was given a packet of dukkah from Allspicery and the ingredients listed a mixture of toasted sesame seeds, almonds, hazelnuts, cumin, coriander, and sea salt. I customized it by adding coarsely chopped pistachios and freshly ground fennel seed to the blend. The best place to store your homemade dukkah is in the refrigerator, in a small, tightly covered jar. This will prevent the oil in the nuts from turning stale. In my experience, I have found that hand-chopping or using a mortar and pestle produces a courser consistency. Conversely, the blender or food processor will produce a finer, powdery blend so it depends on what you plan to use it for and whatever you like. Dukkah is typically served as a dip, with bread and olive oil. It can also be served on meats, vegetables, and appetizers. It can even be sprinkled on desserts such as fruits and custards. Furthermore, if you’re into baking bread, it is wonderful blended into bread batter. 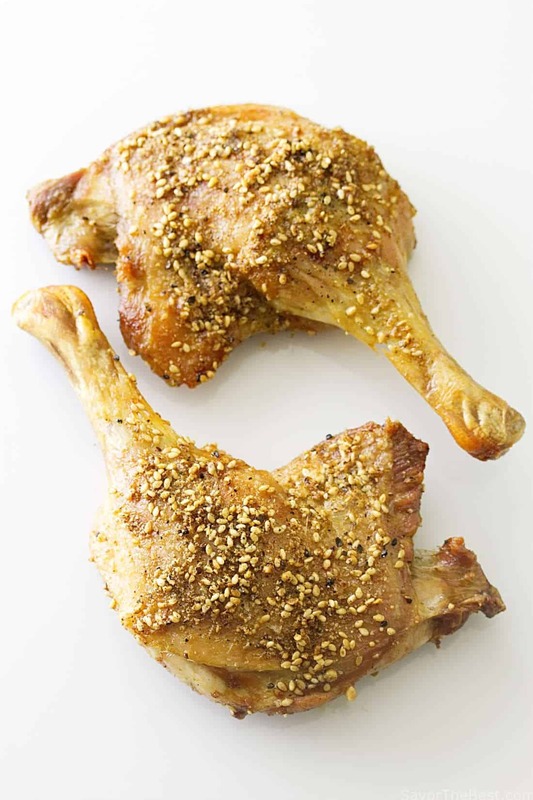 This particular blend of dukkah gives a lovely exotic crunchy crust to our roasted duck legs. Duck is available in the frozen poultry section of most grocery stores. You will find it parceled into packages of whole ducks, duck breasts or duck legs. Duck is a little on the pricey side at $11 for a package of two legs but that isn’t too bad considering it is for a special event, and it does make an elegant dinner entree. Beside that, this is much cheaper to make at home than it would be if you purchased it in a restaurant. There is a good amount of fat in the duck legs and several pricks with a sharp skewer will help release the fat and baste the legs as they roast. After pricking each leg several times I oiled and seasoned them. Next, I dusted them liberally with that fragrant dukkah which adds an exotic flavor as well as an herby, nutty crust to the crisply roasted legs. 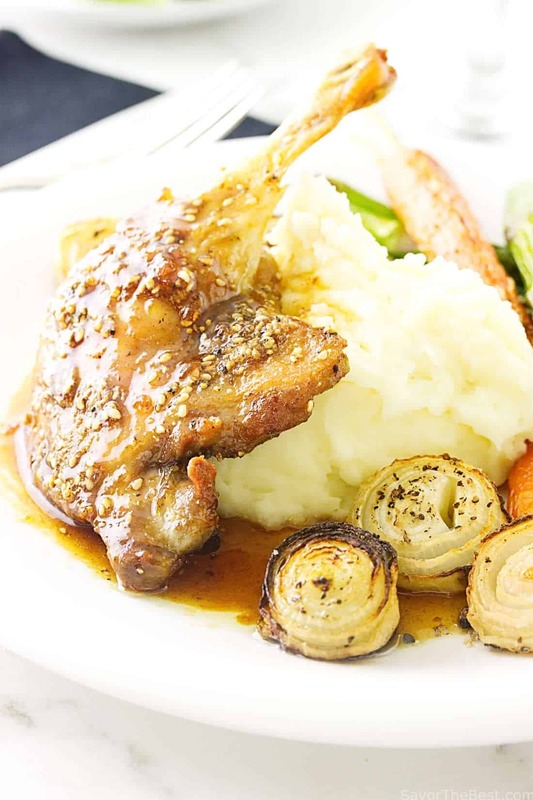 Yum, Dukkah Roasted Duck Legs, mashed potatoes, and roasted veggies! As the duck legs roasted, I prepared a savory-sweet fig glaze to spoon over the legs at serving. The fig glaze is a blend of dried figs, shallots, garlic, honey, white balsamic vinegar, cumin, and fennel. Just before serving, drizzle this sweet-savory fig glaze over the duck legs. It is a perfect balance to the richness of this tender delicacy. By the same token, it makes a delicious gravy for your mashed potatoes. 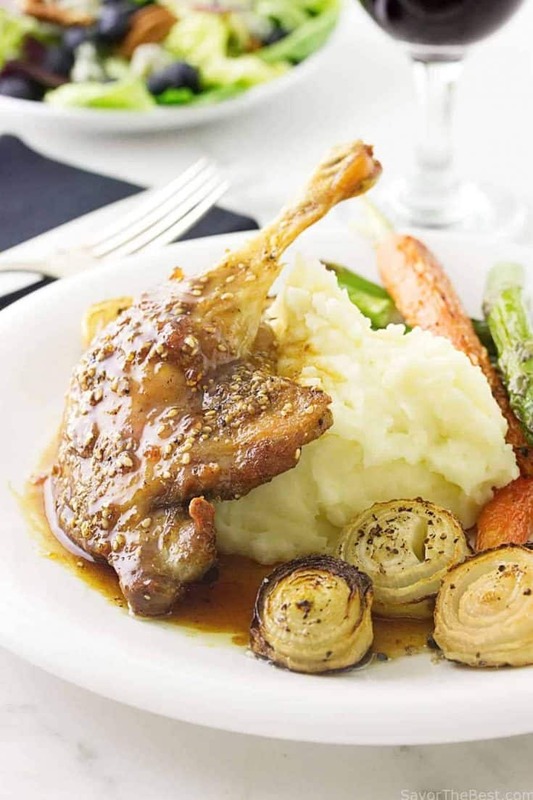 This Valentine’s Day dinner of dukkah roasted duck legs was served with mashed potatoes, roasted tiny onions, carrots and asparagus spears. Don’t you just love Valentine’s Day! This is a special make-at-home elegant dinner for two. Tender, succulent Dukkah Roasted Duck Legs. There is a touch of magic from a nutty dukkah crust. A savory-sweet fig glaze is spooned on the legs at serving. Preheat the oven to 350°F and set a wire rack over a medium-size rimmed baking sheet. Using paper towels, pat the duck legs dry; with an wooden skewer, prick the fattiest parts of the legs in 3-4 places. Brush oil on the legs then sprinkle a tablespoon of dukkah on both sides of each duck leg. Arrange the duck legs on the wire rack and transfer to the oven. Roast for about 1 hour and 15 minutes. Remove from the oven and allow to rest 5 minutes. In a small saucepan set over medium heat, add the oil and when it is warm add the shallots and cook until soft. Add the garlic and cook another 30 seconds until fragrant, then add the chopped figs and the chicken broth. Cook until the figs are soft and jammy. Add the spices, salt, pepper, honey, vinegar and wine. Bring to a boil, then reduce the heat to low and allow the mixture to simmer and reduce to a syrupy consistency. To serve, spoon the fig glaze over each duck leg. 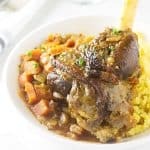 I used the frozen all natural duck legs by Maple Farms, they are nitrate and additive free. A Vac/Pack of two will weigh approximately 16 ounces. Thaw in the refrigerator overnight. Pour the sauce into a small pitcher or jar and set it in a simmering pan of hot water to stay warm. This recipe will make about 3/4 cup of glaze and will keep 2-weeks when refrigerated. I adore this recipe! Dukkah and duck sound like a great combination and that fig sauce sounds awesome!! This looks like a restaurant dish, honest! Can’t wait to make this on my own for the weekend dinner for my family. Thank you for sharing such an amazing looking dish. Will give you a follow up on what justice I did to your recipe! I’ll never say “no” to duck — love its rich flavor. And you’ve really upped its flavor with the way you’ve prepared this! 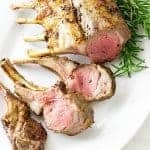 Wow, fabulous recipe! Thanks so much. You’re right, it’s a great idea for a Valentine’s Day dinner… gonna save it here, I’m feeling ambitious 😉 and thanks for the tip!